You can tell when high school sophomores are studying “Romeo and Juliet,” because they all start biting their thumbs at each other. It’s not always clear if they have absorbed anything else from the play, but, like Don Quixote’s windmills, Eliza’s dash across the frozen river and the romance of Boris and Natasha, it’s in the first part and attention spans are, after all, limited. Also they are 15 years old, which excuses a lot. Jeff Danziger is older than 15, and, while he’s never been one to turn away from a quarrel, the scene played out in the news yesterday was a case not of tragedy but of farce: The story of a thumb never bitten. 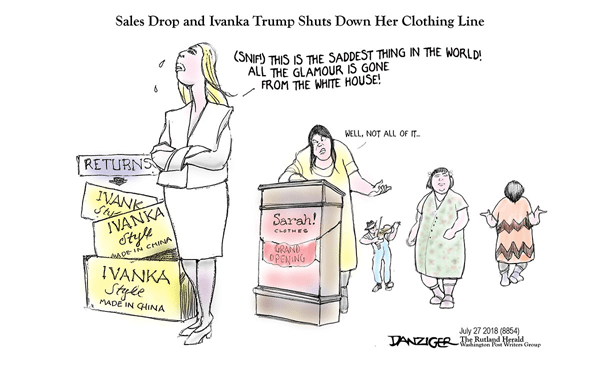 Here’s the cartoon he published about Ivanka Trump’s decision to stop the sale of her clothing line. It’s a well-done piece with traces of Danziger style all over it, including the bumpersticker and the signs on the consignment shop, and the affectionate traces of a backcountry in which good manners are more common than bad vibes. I greatly admire Danziger’s work and so was particularly surprised and disappointed in the cartoon for which, the news reports here and here and here and here told us, he had apologized. None of which I would write about, given that my colleague DD Degg already reported it here. No reason for us to both cover the same story. But something in the reports seemed missing and I’ve known DD long enough to know he probably hadn’t missed anything that was there to be had. 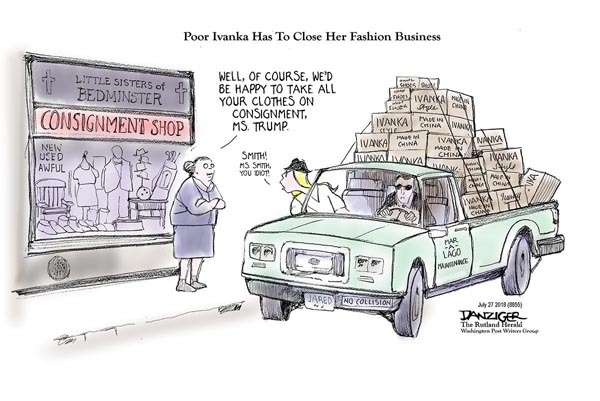 Political cartoonist Jeff Danziger apologized over the weekend for a “body shaming” caricature of White House press secretary Sarah Sanders he produced that was originally set to run in Vermont’s Rutland Herald newspaper. To which he responded that, as far as he knew, he’d caught it in time, though he couldn’t be sure. In other words, it was an unhurled grenade. An insult that never happened. A perfectly healthy and lively Norwegian Blue. I don’t blame others for passing on Politico’s report, since it initially seemed like real news. But it turned out to be gossip: He drew a dumb cartoon, sent it off, thought it over, called it back. DD, however, touched on the deeper story here, and it’s one that matters: The Montagues who passed by in the town square have been spoiling for a fight and will jump on any imagined provocation. 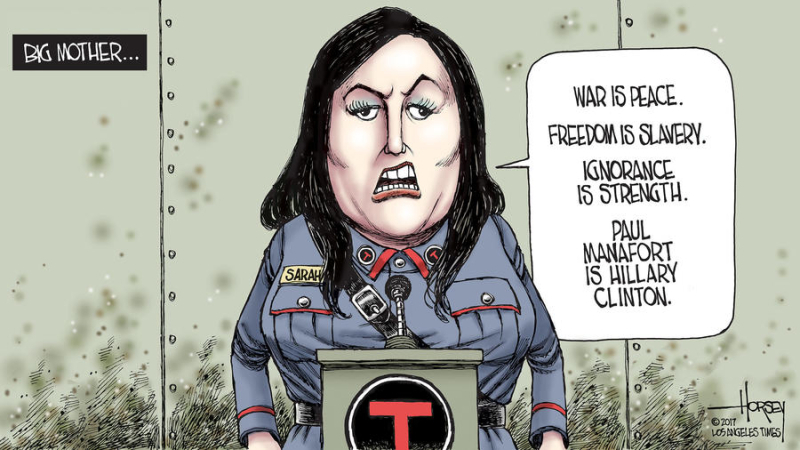 Last November, David Horsey accompanied this cartoon with a column in which he observed that, while Trump’s female staffers often seem more beautiful than competent, Sarah Huckabee Sanders is a very normal-looking person, more like “a chunky soccer mom” than the gorgeous types in the White House. His point was that she’s very good at her job and Trump should be glad to have her around. He also called her a consummate liar, but it was his point about her not being a beauty queen that caused the Montague troll army to draw their swords and attack. They didn’t mind him calling her a liar, but to say she was more valuable than the empty-headed beauties Trump normally hires provided a chance to fake sensitivity rather than simply quarrel. It should have been swatted away as the nonsense it was. Instead, the LA Times responded in gutless fashion by re-editing his column to remove the point about her looking like a normal person. Ultimately, they responded to the rightwing attacks by ending Horsey’s job there. Screw the First Amendment and screw loyalty to your people. And screw the notion that editors are responsible for approving what goes on their pages: They’re only there to correct grammar. I wish it were the first time in recent months newspaper editors have reached for the smelling salts and crawled under their desks, not only betraying their employees but admitting their own incompetent lack of attention to their responsibilities. Apparently, they feel there aren’t enough attacks on the press as it is. Or, perhaps, enough clicks on their web site. 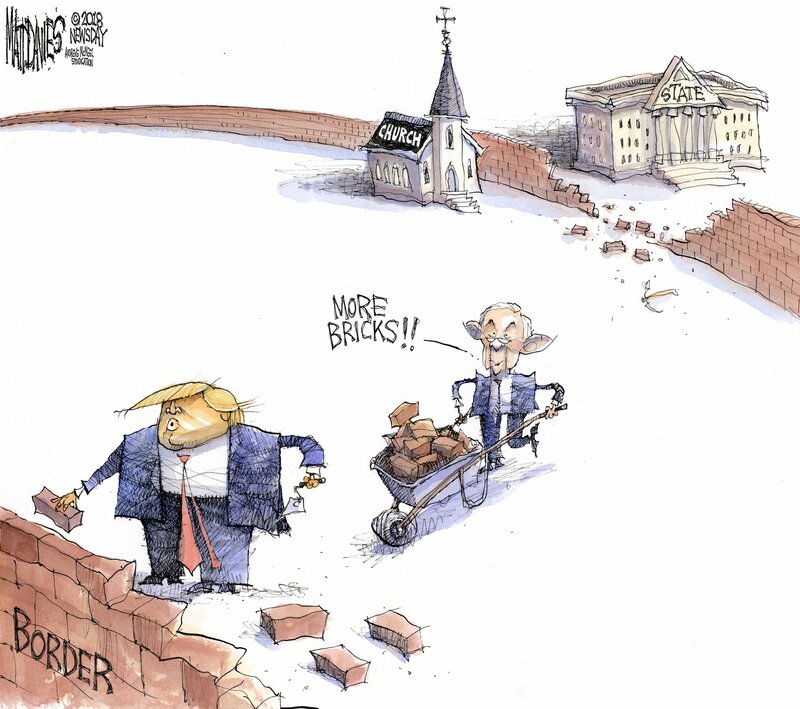 I love Matt Davies’ response to the announcement of a “Religious Liberty Task Force” being formed by Jeff Sessions to insure that conservative Christian dogma is preserved and promoted. In announcing this latest attack on religious freedom, Sessions not only praised the Colorado baker whose trials so far have been a farcical series of erroneous reporting from both sides, but resurrected the old “Merry Christmas” myth, which is based on the anti-Semitic idea that only Christian holidays should be acknowledged, and on the ridiculous lie that people don’t regularly wish each other a Merry Christmas anyway. But please don’t get me wrong: Jeff Sessions is a tall and extraordinarily handsome man. It’s a long, complex novel never well-captured on film, but this scene from the 1948 version shows why you should never send a bully to do a dancer’s job. D’Artagnan would have made one helluva political cartoonist. 24 queries in 0.482 seconds.